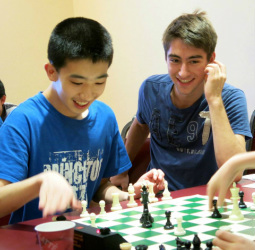 Created in 2006, the United States Chess School provides the nation's most talented young chess players with top-level training from some of the best coaches in the country. At each training camp, a select group of 8 to 16 players receive multiple days of rigorous training and one-on-one guidance from our coaches. The training is free of charge. Students can attend by invitation only. Since our founding, the U.S. Chess School has held over 40 camps, training a diverse group of promising players, from 15 year old Grand Masters to 9-year-old masters. Many of our alumni have gone on to become grandmasters and world champions for their age (see our Hall of Fame and Highlights). In 2013, all 18 players in the U.S. Junior Closed and U.S. Cadet Championship--the most prestigious youth tournaments in the country--were former attendees of the U.S. Chess School. At the U.S. Chess School, we strive to continue to provide these opportunities so all of our brightest chess stars have access to the instruction and appreciation they deserve for their hard work and dedication.